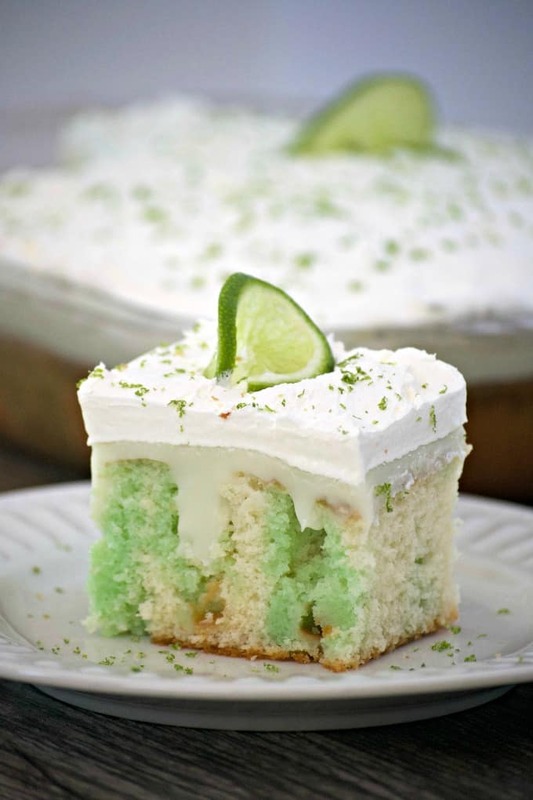 This Key Lime Creme Poke Cake is THE perfect dessert to finish off your Cinco de Mayo party! It’s SO easy to put together and is full of lime flavor. If you’re a Star Wars fan, then May 4th is for you. SO genius. Whoever came up with that?! Then comes May 5th for those of us who like to indulge in Mexican food. I do believe, but don’t quote me on this, that Americans have given this day a whole different meaning. For Mexico, the 5th of May dating back to 1862 was when the Mexican Army was victorious over the French forces at the Battle of Puebla. I found this info. on Wikipedia and who knows how reliable that is. I’m not a history buff, but any excuse to enjoy some great food – I’m there. So, if you’re having a Cinco De Mayo party or even if you aren’t, be sure to add this to your dessert menu. **This post contains affiliate links below. These are links that can take you to a product (or products) that I recommend. I do receive a portion of the sales or credit for my future purchases from any items purchased through those links. Your purchases encourage my baking, cooking and butter habit, and contribute to the life of this blog. I thank you so very much for your support. Let’s keep having fun in the kitchen!! I used this baking dish, this Key Lime Creme Pie Filling and Topping, and this handy dandy wooden spoon to make this Key Lime Creme Poke Cake! I don’t think I’ll be able to stop myself at just one piece of this Banana Toffee Poke Cake. It looks like it would just melt in your mouth! And oh boy! This Pina Colada Poke Cake just has me swooning! I LOVE everything Pina Colada-ish! 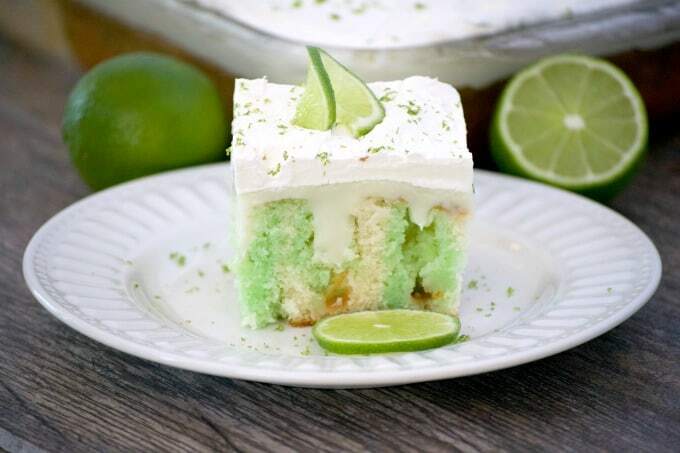 Key Lime Creme Poke Cake is THE perfect desert to top off your Cinco de Mayo party. It's SO easy to put together and is full of flavor. Lime lovers rejoice! Preheat oven to 350 degrees F. and prepare a 9 X 13-inch baking dish by spraying the bottom with cooking spray. In a small bowl, mix lime gelatin with one cup of boiling water until completely dissolved. Mix in the 1/2 cup of cold water. With the end of a wooden spoon, poke holes into the cake about 1 1/2 inches apart. Slowly drizzle the gelatin over the entire surface of the cake so that it is covered and drips into the holes. Spread the Key Lime Creme Pie topping over the cake and then cover completely with Cool Whip. Return to refrigerator to cool for at least one hour before serving. Decorate with fresh lime zest and lime slices, if desired. These Mini Lime Cupcakes with Raspberry Buttercream will look pretty on any dessert table. This Lime Cheesecake Dip is a super easy dessert when paired with some cookies. And speaking of cookies… these Chewy Lime Coconut Sugar Cookies quickly became a family favorite the first time I made them! Thank you so much ! Perfect for warm days too ! Would this work if made in a bunot pan? Lynn, that is a good question and I honestly don’t know. All of the poke cakes I’ve seen have been in a 9 X 13-inch pan. You could definitely give it a try. My suggestion would be to cut the cake in half after it’s baked, poke holes in the bottom layer and then spread half of the jello and key lime filling on it. Replace the top layer and do the same with that. Please let me know if it works out. I’d love to hear! 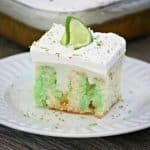 What is the recipe for the key lime topping? But you can find it at your local Walmart which is where I found mine. Such a fan of key lime! I think key lime might be one of my very favorite flavors! I’ve never seen the canned key lime cream in the grocery?